Finding time to bake these days is like finding a little hidden treasure. Those moments when the stars align and I have the killer combo of time, a recipe in mind, and ingredients on hand are priceless. Today, I had all 3, and it was magical. These cookies definitely win for their convenience. The best thing about them was that they didn't require an electric mixer, so no extra cleanup. The other bonus is that the recipe doesn't call for softened butter. I hate getting foiled when I want to bake cookies and my butter is still in the fridge. They came together quickly and I got them prepped and baked all during nap time. Keeping this one on hand for whenever I need cookies in a pinch! 1. Preheat oven to 325F. Line 2 cookie sheets with foil, parchment, or a silicone baking mat. 2. Melt butter and peanut butter together in a medium microwave safe bowl: microwave in 30 second increments, stirring after each one, until melted. Stir sugars into butter mixture until well combined. Set aside to cool to room temperature. 3. Once cool, stir in egg, egg yolk, and vanilla extract with a rubber spatula. 4. Add flour, oats, and baking soda, and stir until well combined. Finally, add chocolate chips and toffee bits and stir until evenly distributed. 5. Scoop cookies by the tablespoon and place in rounds on baking sheets, approximately 2 inches apart. 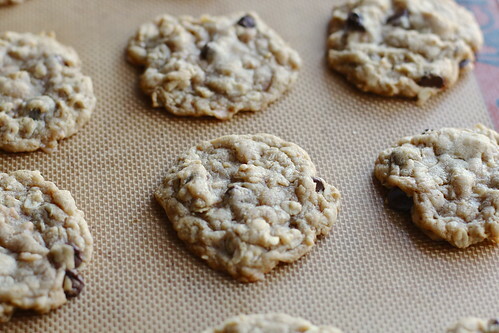 Bake one sheet at a time for 10-12 minutes, or until cookies are light brown. They may appear slightly underbaked. Enjoy! Wow, these look amazing. I can't wait to try them. Find the bridal gown of your dreams today with Justin Alexander!